Katy Kelleher is a writer and editor living in Buxton, Maine. She writes about creators of all stripes, food sustainability, and culture for local and national media. Greta Rybus is a Portland, Maine–based photojournalist with an interest in our connection to the environment. She photographs for publications including the New York Times and Modern Farmer. "The young team behind this sumptuous, classy gift book traveled far and wide across Maine to report these stories, and each feels lovingly told, in words by Kelleher and photographs by Rybus. The concept was to profile makers of all kinds, so you'll find a mix of stories from both the more artistic side of handcrafting, like John Bisbee's metal sculptures, to the highly practical, like a spread on Tim Semler and Lydia Moffet, the bread-baking duo from Tinder Hearth, the much buzzed-about Brooksville bakery." "Kelleher and Rybus - the book's writer and photographer, respectively - have a broad definition of the word "handcrafted." Their smart little collection of profiles includes not just traditional makers - potters, weavers, leatherworkers, and sculptors - but also farmers, restaurateurs, lobstermen, wilderness guides, and even a seaweed harvester. The book itself is a beauty. Rybus (a Down East contributor) shoots in a style that blurs the line between documentary and portraiture - her shots of Maine creatives at work feel like intimate captured moments. Kelleher's accompanying text is on the reverent side, but she doesn't sugarcoat "the handcrafted life." Readers get a nuanced look at how many Mainers make a living with their hands, along with the challenges such lifestyles can entail." 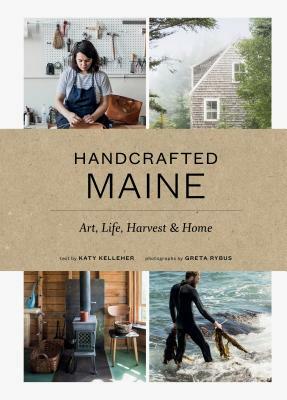 "In 'Handcrafted Maine: Art, Life, Harvest &Home,' author Katy Kelleher presents lively profiles of more than 20 artists, artisans and craftspeople. From a painter, an architect and a boatbuilder to a leatherworker, lobster-men and more, the book celebrates the triumphs and challenges of entrepreneurship and independence. With hundreds of inspiring color photographs and intimate narrative portraits, 'Handcrafted Maine' provides a window into the inner lives of creatives, bringing to life the environment that nurtures a common-sense approach to life and craft." "Through [Katy Kelleher's] insightful essays and Portland photographer Greta Rybus's compelling photos, the book paints vivid portraits of a wide range of creative minds, from wooden surfboard-makers in York, to a meat farmer and noodle joint restaurateur in Portland, to a rustic campsite manager in Portage. Within its pages, "Handcrafted Maine" gives readers a taste of a local-first philosophy that has remained intact in Maine since long before the 'locavore' movement began." "Twenty-two fascinating portraits of artists, artisans, and craftspeople are the focus of Handcrafted Maine. Their stories, clearly written and paired with more than 200 compelling photographs, tell the tale of what it takes to live and create in Maine....Meeting these artists and artisans through this book is a delight."